Back at the start of January, I asked you about your writing goals for 2012 – and I promised that I’d talk about mine. And this week, I’m really excited to be able to tell you about my other big project: I’m writing a book for Wiley’s For Dummies series, provisionally titled Publishing e-Books for Dummies. I’m sure you can appreciate how very happy I was to sign a contract with a publisher (and how proud my mum is ;-)). The book is scheduled to come out in September, so I’ve got tight deadlines for drafting the different sections: if I’m slow to respond to emails or if all goes quiet on Aliventures for a while, I’m probably typing away furiously. The Writers’ Huddle forums are already buzzing with activity, and there’s a lovely sense of community and fun there. If you’d like to join, you’ve got until January 31st – but the sooner you come on board, the sooner you can benefit from the mini-courses, the free ebook, and the interaction in the forums with me and with other writers. Just click here to read all the details about Writers’ Huddle. Once upon a time, I gazed into my crystal ball like a gypsy and read what it contained. Magically, the crystal ball told me that Ali will write a book one day and get it published too. What I witnessed that day has come true and more success awaits you. It is just a matter of time now before other events start to occur in your life. We always knew you had it in you and you could do it. You have a support system in us. So, reach for the stars. And shine. Yes, Writers’ Huddle is buzzing. Lots of pleasant and helpful back and forth, kind of like walking into a room where there’s a party going on and everyone’s glad to meet you. I’ve gotten some really helpful feedback on my About page already, and I only put it up yesterday! It re-confirmed to me how instructive it is to have other writers read your words and then tell you their reactions. I hope can find enough time for that 2nd novel too! Bill Polm’s last blog post ..Are you Asking Enough Questions about your Scenes? Thanks for helping turn the Huddle into a community, Bill; it’s been lovely to see the interaction from you and other members there. Can’t believe we’ve gone over 150 posts in less than a week! Congratulations Ali! You’re great at writing clear and useful advice so it will no doubt be a very handy book to have! Yay! Well done Ali, your hard work has paid off. I am thrilled for you. Sorry that my first comment isn’t favorable, but that’s life, right? I read your blog to get something for *me* This post IMHO is a lost opportunity to reach out and explain why I need to read your book. I’m glad your mother is proud, but that doesn’t pay the bills, right? That is so awesome Ali!!! Cheers to you and congratulations! Bring on the champagne, french naturally, where’s my glass? Many congratulations, you deserve it for all your hard work. I reading word press for dummies at the moment! Cheers, Carole! 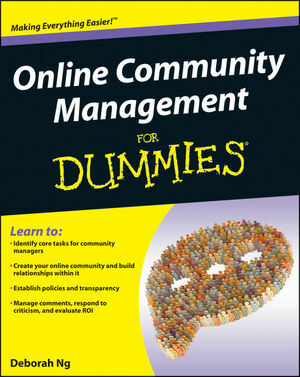 😀 I’ve been reading Online Communities for Dummies (the one I snagged a pic of for the post) — although I’m really not the core target audience, I still found it very useful. I’m inspired by your 2 projects Ali. Can’t wait to see what manifest for all of “us” via all of you!! I love the ‘For Dummies’ series. I own a few, and will definitely look out for your book. When do you think it will be available? I will definitely put a note on my calendar for September (is that right?) to look for this book, because I think by then, I’ll be needing it. Congratulations on the book deal!